Everyone treated so well and I don't do well with doctors, hospital ect. I am so greatful to be cared forin this manner. I pray however I am done with doctors, hospitals ect. I really thank God as well for M's Wendy a very pleasant person. Everyone treated so well and I don't do well with doctors, hospital ect. I am so greatful to be cared for in this manner. I pray however I am done withdoctors, hospitals ect. I really thank God as well for M's Wendy a very pleasant person. Good visit last them fifteen minute. Maen Farha is a detail-oriented and dependable surgeon serving the community of Baltimore, MD. 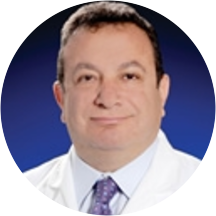 Dr. Farha attended the American University of Beirut Faculty of Medicine in Lebanon, where he received his medical degree and an internship. He then moved to the United States to complete his internship and a residency at MedStar Union Memorial Hospital. Dr. Farha is a part of MUMH Surgical Specialists and is board certified by the American Board of Surgery. Dr. Farha is a member of the American Society of Breast Surgeons, American College of Surgeons, and the Baltimore City Medical Society. Because Dr. Farha is bilingual in English and Arabic, patients from a variety of backgrounds enjoy having him as their physician. Dr. Farha is deeply committed to the well-being of his patients. He takes a thorough and precise approach to his consultations to ensure that he is consistently giving accurate diagnoses. Thorough exam/glad he reviewed mammogram before seeing me. Great bedside manner. Supportive.